Do you have a scrap problem? – Never too hot to stitch! Do you have a scrap problem? Now, my scrap problem is not quite the same as most other quilters: my problem is that the quilters I know keep giving me their scraps because they don’t want to use them nor do they want to throw them away. Here in Australia, quilting fabric starts at $24 a metre at my LQS (yes, you read that right; although it is between $12 and $20 a metre at the Big Box Store), so I can’t understand why anyone would want to throw away any potentially-useful fabric! I can’t predict when scraps will come my way, so just when I think I have the scraps under control, along comes another bag or two and there’s more pressing, cutting, sorting and storing to do. This organising of scraps can eat into my sewing time in a big way so I’m happy to join in this scrap-along which basically involves setting a monthly challenge for the scraps (posted first Wednesday of the month) and sharing my success (or otherwise) on the last Wednesday of the month). Surprisingly, given that the first Wednesday of March was a week ago, the link up for this scrap-along is still open: so that got me thinking about my scrap goals for what’s left of March, given that I won’t be here most of the last two weeks. My scrap storage is organised; if you’re looking for how I do it, please refer to the scrap storage system tab at the top of my home page. Organisation is not the problem, getting the scraps into storage can be! They tend to accumulate along the edge of my cutting table as I cut both the scraps that are given to me and the pieces I need for particular projects. I just don’t stop long enough to put it all away! So my first goal is to cut what is necessary then store all these scraps. These scraps were ironed and placed in this basket so long ago that I can’t remember when! So my second goal is to get all these scraps cut and stored. 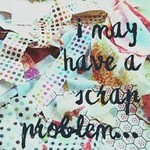 I think, however, my greatest problem, is using the scraps. February was the month of brown over at the Rainbow Scrap Challenge. I started twelve “Shoo Fly” blocks but never finished any of them. I have the centres and the corners but still need all the ‘middles’! Goal #3 is to finish all 12 blocks. Do you want to join in the fun and whittle down your pile of scraps? Keeping up with the scraps is an ongoing issue in my sewing room too. It’s hard to take sewing time and make it clean up time. Good luck with your March goals. Yes, getting the balance right can be tricky. On the one hand, if I don’t cut, I have more time to sew; on the other hand, if I cut, when I want to start another leader/ender project, or a project with my grandsons, the fabric is cut and ready to go! It is always an ongoing problem – while I’ve donated the big pile that had been living next to the bookcase and tipping over constantly, there are still those lurking in the closet and in the “current project” bins where I have all the yardage and scrappy pieces I think ‘might’ work in particular quilt. Good luck with your March goals. All my scraps are donated to me or to our quilting group and then given to me as the ‘scrap lady’! It seems ridiculous that just four years ago I was wondering how I’d ever get a stash of fabric; now I have my own stash (that I rarely get to use) and an even bigger stash of scrap fabric from yardage down to crumbs! Too easy to get sidetracked when the scraps overtake the sewing space. I do a clean up after finishing a project. I tend to pick an easy block and make a few each day —-4 patch, 9 patch, etc —-and eventually I have enough for a throw or quilt. Then when I get overcome with scraps I do a marathon of string piecing or coin strips to clean them out. So true! I try to clean up at the end of each stage of a project but sometimes I put it off until I can’t stand it any longer. It’s so good to find my cutting table again (except for the 200 or so HST lined up on one edge waiting to be trimmed. I’ve told myself I’ll cut twenty a day and that’ll get that mess under control too! As I said in my blog post, organisation is not the problem — using all that fabric is! Thanks for your confidence that I can reach my goals! We’re going away next Thursday so I have limited time in the sewing room this month. I do have a LOT of scraps but I do tend to throw away the small bits at my age; I will never use all the big pieces so who am I kidding! lol Have fun with the new goals for March! Remember when I was concerned about how I was going to get my hand on some fabric? After setting my own stash during a sale, I joined Caring Hearts Quilters — no more need for any more fabric, at least for the foreseeable future! Thanks for stopping by my blog. I love scraps and do use them when I can. The more ways I can use them the better. See you along this wonderful project to tame our scraps. I never liked scrap quilts but, somehow, I ended up being the ‘scrap lady in our quilting group — probably because I can’t bear waste! One thing I like to do is to turn what should be as single piece in a block into something scrappy, like four-patch in the middle of the Churn Dash or crumbs where there should be single square. I can’t wait to take a look at your organization tips – it should be enlightening! You’ve got some very achievable goals there, and I can’t wait to see how you do! Good luck! I hope you got something from reading about my scrap organisation!